In 1974, director William Friedkin released THE EXORCIST and created a genuine phenomenon. His lead actress, Ellyn Burstyn, was vaulted into a position of creative power off the strength of her performance in the film, bestowed with the enviable privilege to choose whatever role she wanted next. A brilliantly gifted performer, Burstyn was dissatisfied with the limited number of options available to actresses—she didn’t want to play another supportive housewife or put-upon mother, but ironically her next role would be just that, albeit with a twist that would allow her to own the role completely— all the way to a Best Actress win at the Academy Awards. She chose a script by Robert Getchell called ALICE DOESN’T LIVE HERE ANYMORE, and acting as the de facto executive producer, she went about searching for a young, up-and-coming director to helm the film. Burstyn started by soliciting suggestions from director Brian DePalma, who would serve as her conduit into the larger pool of young directors. Interestingly enough, they all knew each other from film school—they were an entire generation linked together as a social community, something that young filmmakers take for granted now. 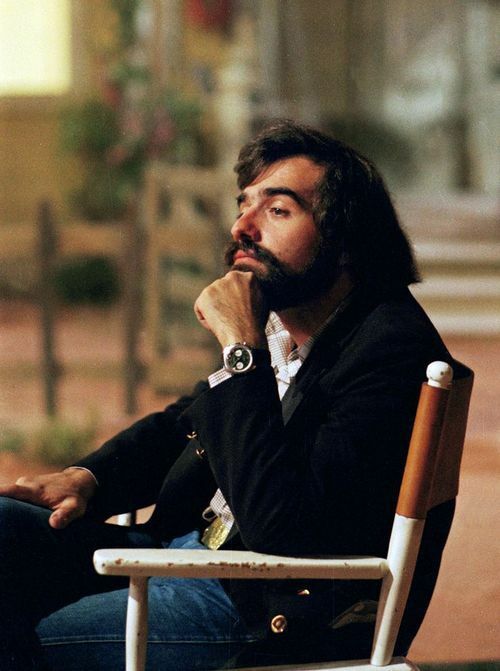 DePalma led Burstyn to Francis Ford Coppola, who in turn recommended a young hotshot named Martin Scorsese, fresh of his breakout third feature MEAN STREETS (1973). Burstyn liked the gritty immediacy of Scorsese’s film, but was unsure his sensibilities would translate to a feminine perspective. During their meeting, Burstyn reportedly asked Scorsese what he “knew about women”, to which Scorsese replied, “nothing, but I’d like to learn”. Burstyn hired him on the spot, and before he knew it, Scorsese was on the set of his first true studio feature film. ALICE DOESN’T LIVE HERE ANYMORE takes place in the arid deserts and crumbling dwellings of the American Southwest. Alice (Burstyn) is a humble housewife living in New Mexico with her rowdy, rebellious son Tommy (Alfred Lutter), and a husband who only pays attention to her when he’s angry with her. Alice is fundamentally unhappy with her situation—not that she’d ever admit it to anyone. One day, her husband is killed in a trucking accident, leaving Alice and Tommy’s future very uncertain. With little money to go off of, they decide to pack their things in search of a better life in Monterey, California—the idyllic town where Alice spent her childhood. They hit the road, stopping along the way so Alice can find work as a singer. While this provides some cash flow, it also attracts bad characters, like a philandering, abusive young buck named Ben (Harvey Keitel) who is no better than the dead husband she left behind. Alice gets another job as a waitress in an Arizona diner so that she can more reliably provide for her young son. It’s here that she meets David (Kris Kristofferson), a quiet rancher with kind eyes. Alice and David eventually fall in love, but like any relationship, it’s not without its share of turbulence. Ultimately, ALICE DOESN’T LIVE HERE ANYMORE is a character test—Alice has to go through a crucible of her very own in order to prove her mettle as a modern woman and take charge of her own destiny. As I wrote above, Burstyn won the Best Actress Oscar for her portrayal of Alice, a modern woman with old-fashioned sensibilities. She’s put through the veritable wringer and somehow comes out the other end not just intact, but better than before. The same year that ALICE DOESN’T LIVE HERE ANYMORE was released, Scorsese’s friend and mentor John Cassavetes released his acclaimed A WOMAN UNDER THE INFLUENCE, and Burstyn’s performance in the former film sharing some character traits with Gena Rowlands’ performance in the latter leads me to wonder if Scorsese’s direction wasn’t informed by Cassavetes’ work somewhat. The Oscar win was just the icing on the cake of a banner year for Burstyn. Burstyn is surrounded by an ensemble of fine actors, led by Kristofferson’s strong silent-type rancher, David. Harvey Keitel, in his third collaboration with Scorsese, bring his signature New York-style machismo to the role of Ben, a foppish, philandering cowboy with a serious anger problem. Alfred Lutter makes his film debut as the nerdy smartass Tommy, and while he makes quite a splash here, he couldn’t quite generate the momentum he would need to sustain a serious acting character as he grew up. A young Jodie Foster also appears as Audrey, a tomboyish delinquent and latchkey child. Scorsese was pleased enough by Foster’s performance to bring her back for his next feature, 1976’s TAXI DRIVER and set her on her way to becoming the world-famous actress she is today. The film also contains a few cameos by early Scorsese regular Harry Northrup as a bartender and the director himself as a barely-visible patron in Alice’s diner. 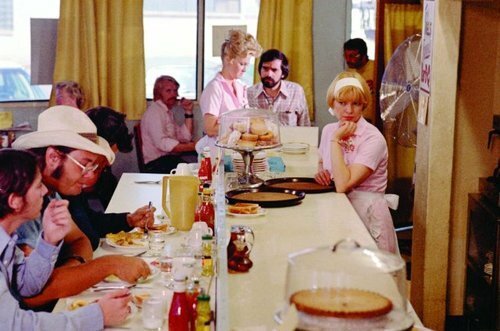 Scorsese reteams with his MEAN STREETS cinematographer Kent Wakeford for ALICE DOESN’T LIVE HERE ANYMORE, giving the film a brighter color palette and overall feminine touch to distinguish it from their previous effort. Scorsese and Wakeford use a variety of handheld, dolly, and crane movements to inject an immediate sense of reality and grit to the 35mm film image, which contrasts quite starkly with the opening sequence set in idyllic Monterey, which—with its nakedly theatrical soundstage look—serves as an homage to THE WIZARD OF OZ and conjures up the idea of Monterey itself as this mythical place full of happiness and innocence that may have never actually existed to begin with. Scorsese also incorporates touches of French New Wave technique, like rack zooms and jump cuts as a way to add some edge to an otherwise conventional “flyover-country melodrama”. His inspired approach to the execution of the film extends to the selection of his key collaborators behind the scenes. As a young man, Scorsese wisely assumed he had no proper frame of reference to authentically portray a female point of view, and as such he turned to strong, talented women for help at every opportunity. For instance, Toby Carr Rafelson (wife to Bob Rafelson of FIVE EASY PIECES (1970) fame) served as the production designer, while George Lucas’ then-wife Marcia performed editing duties. Finally, Richard LaSalle is credited for the film’s music, but ALICE DOESN’T LIVE HERE ANYMORE is another instance of Scorsese’ affection for rock music bleeding into his art, incorporating contemporary tracks from artists like Mott the Hoople and Elton John in a bid to flesh out Alice’s particular world. While Scorsese may be way out of his comfort zone in terms of locale and subject matter, ALICE DOESN’T LIVE HERE ANYMORE still bears his undeniable stamp. The men in Alice’s life are impulsively violent and quick-tempered, and when they indulge in their impulses, the results are messy, chaotic and unpredictable. Indeed, even out in the vast expanse of Southwestern desert, Scorsese still can’t escape the random violence of urban life, such as the scene where Alice and Tommy lay in bed listening to a couple loudly fighting in the next hotel room over. Like their east coast counterparts, the characters that populate Scorsese’s Southwest don’t put on any airs, unafraid to utter casual profanities or rough up their spouses in the presence of others. ALICE DOESN’T LIVE HERE ANYMORE was released to near unanimous praise from critics, leading all the way to the aforementioned (and well-deserved) Best Actress Oscar win for Burstyn. The film was so well received that it even went on to inspire a sitcom called ALICE, set in the same diner as the film and featuring some of the original cast members in regular roles (Burstyn herself would not reprise her role). For Scorsese, his great work here would eventually be overshadowed by the outstanding legacy of his later works, and thus remains a minor entry in his canon—a curious departure from the east coast world he knew so well and the hard-edged mentalities of the people who inhabited it. Nevertheless, the production ofALICE DOESN’T LIVE HERE ANYMORE broadened Scorsese’s worldview and bestowed him with the necessary creative momentum to get his next feature off the ground—a feature that would undoubtedly become his first true masterpiece. ALICE DOESN’T LIVE HERE ANYMORE is currently available on standard definition DVD from Warner Brothers.